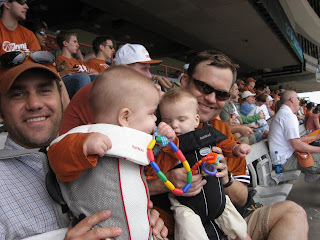 David and Jason took the boys to the orange and white scrimmage game. It was their first football game and of course they loved it - there was lots of activity, people and colorful players running across the field to watch. They likely got the idea that football is an exciting sport. Despite missing nap time they were generally in good spirits. Apparently Will would get a little fussy when the cannon would go off disturbing his attempt to catch a nap. And don't worry, Lily will get to go another time. We have been rotating through activities so that there is one adult per baby and they can get undivided attention. Last week Lily and Evan got to go on a field trip to IKEA which was another busy, colorful place with lots of new things to see. This morning Will and I went for a walk to Pacha together for my morning coffee, enjoying all the birds and spring flowers along the way. Most of the time they have to share our attention and their toys and are already learning how to wait their turn, for the next bite of food or for their bath. They should be pros at sharing and cooperation by the time they get to preschool. David took me along on his business trip to San Diego this week. We spent a night at the Hotel Parisi. Our room had a stunning view of the Atlantic...ahh. He took Wednesday off so we could hike along the beach and enjoy a leisurely day together. We had dinner at George's on the Cove where we enjoyed some great wine, smoked mussels and an amazing view and sunset. I also got my first massage since the babies were born. Mom and Mayela worked overtime to take care of the babies, especially since I got stuck in Phoenix on my way home for an extra night. I was very happy to be reunited with my brood on Friday. Lily even gave me the cold shoulder! but she warmed up quickly and our happy family was back together again with David's arrival from New York. It seems that the babies changed so much in just three days. Evan is now holding his feet and enjoys playing peek a boo. They all tried out their new highchairs and sippy cups for the first time. Of course determined Lily already has it down - she can hold her own sippy cup and get her spoon in her mouth. We got our first shoes this weekend. Aww, so cute. We've reached the half year mark! The babies are growing so fast. It is a delight to see them continue to try new things. Will, Evan and Lily are able to entertain themselves more these days - comfortably pushing up, rotating and reaching to grab and play with their toys or each other. Evan was banging on his baby keyboard with both hands yesterday having a great time. Will has discovered his feet and loves to put his legs up in the air and grab his toes. Lily can amuse her self with anything, happy and giggling while rolling over and over. They still love books but turning the pages or eating the pages is becoming more fun than listening to the stories. Unfortunately RSV season has not ended. We were instructed to stay dilligent with handwashing and keep the babies away from children in day care or anyone with a cold through at least April or possibly May when we get the all clear. Doctor gave us the ok to continue on rice and assorted fruits and veggies. We can start trying sippy cups with apple juice and water now too. At 7 to 9 months we should add meats and mixed baby foods. No fish, peanut butter, OJ or egg whites until at least one year as these may trigger allergies. Girls went on a walk to Pacha for a latte this morning. I've been trying to spend more one on one time with each baby for a special treat for both of us. 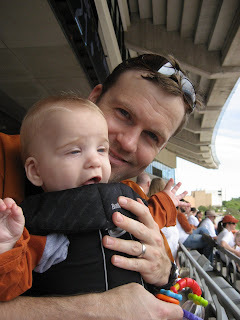 I took Lily this morning in my fun new Zolawear sling (a local austin company). She loved it, so did I. Last night Team Freas hit a big milestone. The kids went down at 7pm and slept until 6am the next morning! Mom and Dad celebrated by taking the family for a morning jog. Evan has been enjoying practicing turning from back to front by twisting his legs over. He doesn't quite make it all the way yet but he is so close and determined. He's made great strides in bath time, actually starting to enjoy himself on occasion. Evan is very outgoing and adorable at bedtime, when changing into pjs he gets ticklish and loves to laugh. Lily has become quite adept at managing her bottle and she likes to hold it all by herself during feeding times. What a independent girl. Lily is an extremely happy baby and she has a stellar smile. We will go to get her after naps and often she is talking or singing to herself content in her crib. When she sees us she kicks and smiles with excitement. Will is now rolling over easily and can even sit up for extended moments of time. He has been exploring making new sounds including blowing rasberries to get our attention. He looks like a Gerber baby with his chubby cheeks, large eyes and no hair. Will is a mellow tempered baby and has a sweet flirtatious smile. They have all been enjoying their first solids. Squash was their foray into solids. Green beans didn't go over so well (ask David) but bananas are a favorite. They have also sampled carrots and apple sauce. They are now enjoying their toys much more. 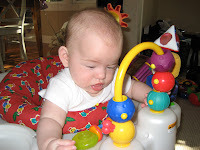 The exersaucer is a new addition and keeps them enthralled for many minutes. Evan is able to twirl around to explore the variety of toys, Lily likes to have conversations with the hand puppet duck, and Will likes to activate the dragon stuffed animal by squeezing the buttons on its hand. Lets see...their favorite books these days are Oh my, Oh my, Oh Dinosaurs, Pajama Time, Ten Little Ladybugs and Urban Babies Wear Black.